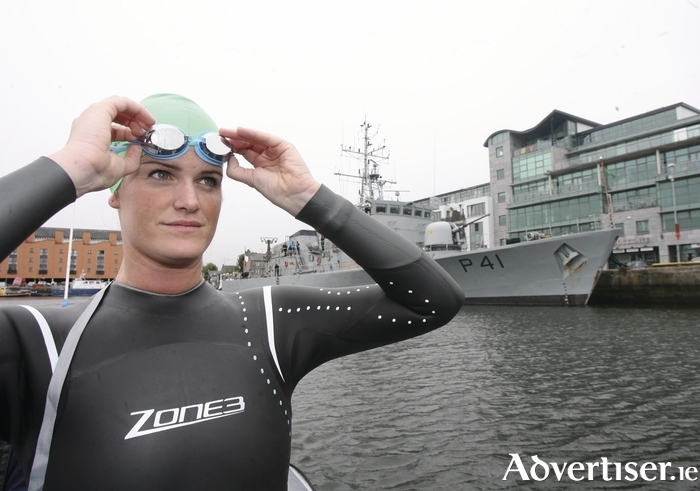 Swimmer Kate Varley officially launched the Frances Thornton Memorial Galway Bay Swim on Saturday in Galway Docks. The Frances Thornton Memorial Galway Bay Swim, in aid of Cancer Care West, was officially launched on Saturday May 23, on board L E Orla which was stationed at Galway Docks. With almost 100 swimmers taking part this year, it is now one of Ireland’s biggest and longest one-day swims. The organisation aims to raise €100,000 this year to mark the 10th anniversary of the swim. Beginning from Aughinish in Clare and finishing at Blackrock diving tower in Salthill, the swim is a distance of roughly 13 kilometres. Speaking at the launch of the event, Brian Thornton, director of Cancer Care West, said: “The swim started with three guys wanting to swim the bay to raise some money for a service that helped Frances so much when she was sick. “The event has grown from year on year and now, entering its 10th year, there will be more than 70 swimmers, 80 boats and a few hundred volunteers. The event has raised over €500,000 and this year we are hoping to raise €100,000 to mark the 10th anniversary. “The Cancer Care West respite facility offers such a great service to people who have cancer, and to their families and friends supporting them through the illness. It was very fitting that the L E Orla was the venue for this year’s press launch, given the many volunteers of the Galway maritime community that give up their time year in and year out. Without them, the event wouldn’t be possible,” he concluded. The Frances Thornton Memorial Galway Bay Swim will take place on Saturday, July 25.